The Pittsburgh Steelers did the most important thing you can do in a draft, they covered the majority of their needs. Sure there weren’t a lot of big names here but I do like the Cameron Heyward pick a lot for Pittsburgh. He is a versatile player that can play either the end or tackle position in a four man front. He is a relentless pass rusher with a quick first step and the ability to stay low and get the advantage on an offensive line. Gilbert fills a hole on their O-line and should be able to step in and contribute immediately. I really like the Carter pick-up late. He is not the most explosive player but he is strong and is a great tackler and could develop into a good OLB against the run. The biggest flaw that I can find in the Steelers’ draft is they really needed to find a way to bolster their receiving corps and did not do so in this draft. Re-signing Ike Taylor was a priority for the Steelers. For the Steelers, free agency was largely about making sure they continue to have a great offensive line. Their line has been a big part of their three Super Bowl appearances in the last 7 years and with the Steelers, they seem to believe that Scott and Colon are preferrable to Adams and Starks. The Steelers did the most important thing that a team can in free agency which is re-sign your key guys. Additionally, the Steelers were in desperate need of a wide receiver if they plan to repeat as AFC Champions and were able to pick up Jerricho Cotchery this week who should fit into their offensive scheme perfectly. I feel like Ozzie Newsome and the Baltimore Ravens find good value late in a draft better than anyone else. In the first round they got the shutdown corner they needed in Jimmy Smith. I feel that Jimmy Smith should not have fallen past the 15th pick but character issues (much like Percy Harvin a few years ago) caused him to slide and Baltimore gets a great value here. Torrey Smith is a wideout who has blazing speed and will be popular with the fans being a Maryland Terrapin and all. I am really curious to see the path that Tyrod Taylor’s career take as I am always intrigued by college quarterbacks who are drafted as wide receivers (Brad Smith, Joe Webb, Antwaan Randle El, Julian Edelman, etc.). Overall I really like this draft because the Ravens got the most bang for their buck and did feel some immediate needs. However they ignored their gaping need in the safety position which I see as this draft’s biggest failure. Before yesterday, I would’ve graded Baltimore’s free agency period and trades in the C+ range because while I do like their additions – I feel like the team lost a lot. However, I have them sitting higher because the 4th round pick for Lee Evans may be a better value trade than McNabb for a 6th round pick to Minnesota. Now I am not promising 23 touchdowns for Evans, I am just saying ask Bill Bellichick what happens when you give up a 4th round draft pick to get a talented receiver out of an unfavorable situation. I think that Evans is an upgrade over Derrick Mason and will pair nicely with Boldin and Smith. The upgrade of the receiving corps over the last two seasons should make this a career year for Joe Flacco. Leach is a bruiser of a fullback and an upgrade over McClain and re-signing Carr was necessary. I still feel they lost a lot though with the departure of Dawan Landry, Todd Heap, and Josh Wilson. I really liked Cincinnati’s approach to this draft. They had a lot of needs going in and as opposed to panicking – they simply adopted a B.P.A. (Best Player Available) approach and in doing so were able to fill many of their holes. They used the 4th overall pick to take the best wide receiver prospect I believe we have seen since Calvin Johnson. A.J. Green will be a star in this league. The Bengals foresaw the departure of Ochocinco and Palmer and used their first two picks to address that. Considering that 4 quarterbacks were drafted in the first 12 picks, I consider the Bengals finding someone as good as Andy Dalton in the 2nd round an absolute steal. If I had to declare a draft winner right now, it would be a toss up between Detroit, Cincinnati, and the next team I’m going to discuss. I love the Robert Sands pick in the 5th round – he is an intelligent player who plays aggressively. He has a great awareness about him and his long arms and great hands have me believing he could develop into quite the ballhawk. He reminds me of a larger Darren Sharper. I also think that Jay Finley was a great 7th round pick, he’s a running back who could be a solid number 2 in this league. The biggest departure of free agency for the Bengals was not Chad Ochocinco or Carson Palmer . In my mind, it was Johnathan Joseph who many overlooked in free agency in light of the Nnamdi Asomugha sweepstakes. Nate Clements was a good effort to replace Joseph but he is nowhere near as good. The Bengals anticipated Palmer’s retirement and the Ochocinco trade and in my opinion, upgraded at the wide receiver position when they drafted Green. Cedric Benson was necessary to bring back and I really like the Gradkowski pick-up. Gradkowski is a quarterback who has never gotten his due, similar to Jeff Garcia, but he does find ways to win games for bad teams and provides good competition for Dalton. I like the Thomas Howard signing as well but to me the retirement of Carson Palmer and departure of Johnathan Joseph severely set the Bengals back for this season. You know what I have always admired about Mike Holmgren? He is a realist who knows what he wants. In my mind, when Cleveland landed the 6th overall pick there were only 3 players worth them taking with that high of a pick – Georgia WR A.J. Green (went 4th overall to Cincy), LSU CB Patrick Peterson (went 5th overall to Cleveland), and Missouri DE Aldon Smith (went with the 7th overall pick to San Fran). When Cleveland’s turn came up, Holmgren decided Aldon wasn’t the way to go with that pick and so instead of taking a player too high or one he had no interest in – he got Atlanta to pay him a king’s ransom so they could draft Julio Jones. Later on they were able to get the big run-stopping D Tackle they needed in Phil Taylor and with the Falcons’ 2nd round pick they got a big target who can stretch the field for McCoy in Greg Little. Overall I like this draft, not just because of who they grabbed this year but because of how it prepares them for future drafts to truly rebuild this team. Holmgren is very realistic about where the Browns are as a franchise and as someone who has 3 conference championships and one more Super Bowl ring than the entire Browns franchise, knows the personnel he needs to get them there. Pat Shurmur did a great job with Sam Bradford and now has Andy Dalton to develop. When it came to the free agency period, the Browns did a couple of things right – they hired a great offensive mind as their new head coach in Pat Shurmur; they traded for Jon Greco, a strong offensive lineman who should solidify the right side of the line; and they signed Usama Young from the Saints who I believe upgrades their safety situation over the departed Abram Elam. When I look at Cleveland’s free agency period though, for me it will always be about what they did not do. They had the most cap room of any NFL team and did not even make a run at defensive end Ray Edwards, or wide receivers like James Jones, Malcolm Floyd, Michael Jenkins, or Mike Sims-Walker. There was no upgrade to their pass rush, no addition of difference-makers, and the Browns had more capacity to do that than anyone. In a short free agency period, the fact they could offer more money with less time to decide worked in their favor. As a result, I believe they were the biggest losers in free agency. Like all stories from “The Funyun”, the post below is a work of satire, parody, and fiction. While the names of famous people and actual events are referenced, this story should not be considered a valid news source. Darrell Bevell joins the Seattle Seahawks after five years as Offensive Coordinator for the Minnesota Vikings and has already brought Sidney Rice (left), Tarvaris Jackson (center), and Frank Walker (unpictured) with him. Pete Carroll is currently courting Vikings LB Ben Leber (right) thinking this could yield 2005-type results. After pulling off the biggest upset of the NFL postseason in 2010, the Seattle Seahawks and head coach Pete Carroll hope to build off that season in 2011. 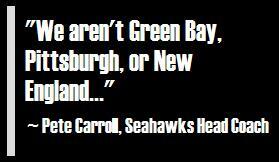 Carroll was excited by making it to the divisional round of the NFC playoffs but feels his team can do better. “It has always been our goal to play in an NFC Championship game. We fell one game shy of that goal last season and I knew we had to make the right draft picks and bring in the right staff and players to make that possible.” In pursuing the Halas Trophy, the Seahawks have made some major additions this offseason. The Seahawks started by bringing in offensive guru Darrell Bevell who spent the last five years under Brad Childress and the Minnesota Vikings and parting ways with Pro-Bowl quarterback Matt Hasslebeck. While in Minneapolis, Bevell saw the Vikings win the NFC North twice and come within an interception of playing in Super Bowl XLIV. In going to Seattle, Darrell Bevell brought two of his own offensive players, quarterback Tarvaris Jackson, and the All-Pro young deep threat Sidney Rice. In recent days, cornerback Frank Walker has followed his Vikings teammates to the Pacific Northwest and the Seahawks are currently in talks with the hard-hitting veteran linebacker, Ben Leber, also from the Minnesota Vikings. Since that Super Bowl berth, the Seattle Seahawks have lost grasp of a division they once dominated as the Arizona Cardinals took the division and even made it all the way to the Super Bowl a few years back. The Rams have their quarterback of the future in Sam Bradford and new coach Jim Harbaugh in San Francisco promises to shake things up for the 49ers. Offensive Coordinator Darrell Bevell feels that the Seahawks are primed to repeat in the NFC West this season. 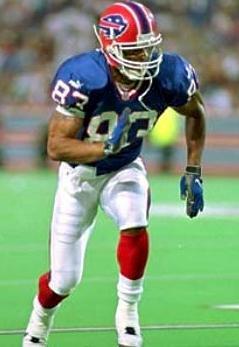 Andre Reed played in and lost 4 straight Super Bowls, finished his career in 2000 with 951 receptions, and is waiting on the call from Canton. Would he consider one last "almost win" to solidify his HOF bid? Carroll also mentioned that while talks remain ongoing with the Viking’s Ben Leber they have also reached out to Brett Favre, Randy Moss, Bryant McKinnie, and even inquired about a possible trade for Bernard Berrian. There is a lot of hope in Seattle these days with players feeling that they could play in the NFC Championship game this year and find themselves back in 2005 form so they can play in a Super Bowl. Bevell even noted that the Seahawks had reached out to Andre Reed and Cris Carter in the last week just to see if they would like one last chance to almost win a Super Bowl and solidify their Hall of Fame bids by being on a Super Bowl runner-up.